This pastoral wood chip holder may serve as a keepsake container for your guest signing wood chips. 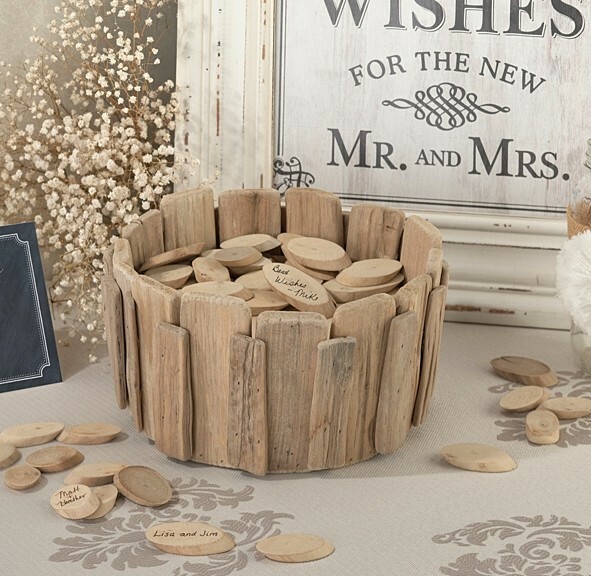 Signing wood chips are a contemporary alternative to the traditional guest book where guests pick a wood chip and write their names and/or well wishes on the chip and place it into the wooden holder. Approximately 60-70 chips and an instruction card is included. A signing pen is not included. Additional signing wood chips are available separately as Product Code: LR-GA561-A. The pictured "Wishes for the New Mr. & Mrs." white-wash-style sign frame is not included and has been discontinued..